Four Squares, Two Congruent Parallelograms, Congruence. Triangle, Centroid, Outer and Inner Napoleon Equilateral Triangles. Circle, Angle Bisector, Secant, Triangle, Circumcircle, Congruence, Area. Triangle, Circle, Incenter, Circumcenter, Excenter, Circumradius, Perpendicular, 90 Degrees. 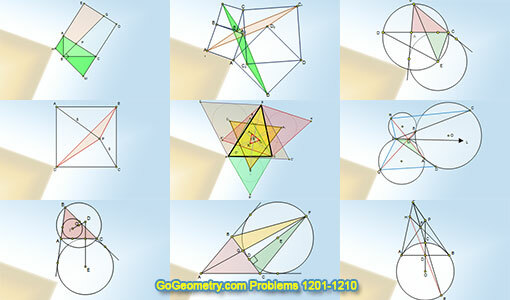 Triangle, Circle, Excircle, Excenter, Circumcircle, Congruence.